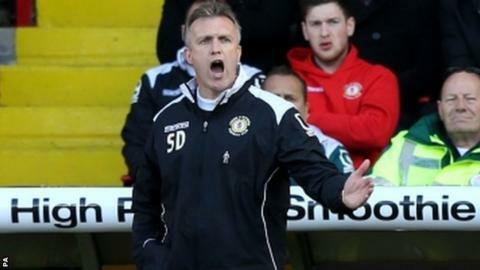 Crewe manager Steve Davis. His team remain in trouble after their draw against Walsall. Tom Bradshaw's late effort extended Walsall's unbeaten run to five games as they fought back to draw at Crewe. Crewe striker Marcus Haber wasted a one-on-one opportunity before heading the Alex in front on 13 minutes. Kieron Morris and Andy Taylor wasted chances for Walsall but a deflected effort from Bradshaw nine minutes from time caught out Crewe goalkeeper Paul Rachubka and spun into the corner. Crewe, who have not won in five games, remain in relegation trouble. Match ends, Crewe Alexandra 1, Walsall 1. Second Half ends, Crewe Alexandra 1, Walsall 1. Attempt missed. Sam Mantom (Walsall) right footed shot from outside the box misses to the left. Corner, Walsall. Conceded by Greg Leigh. Attempt missed. Jordan Cook (Walsall) right footed shot from outside the box is too high. Corner, Walsall. Conceded by Paul Rachubka. Attempt saved. Jordan Cook (Walsall) right footed shot from outside the box is saved in the top left corner. Corner, Crewe Alexandra. Conceded by Ben Purkiss. Attempt saved. Anthony Grant (Crewe Alexandra) right footed shot from outside the box is saved in the top centre of the goal. Goal! Crewe Alexandra 1, Walsall 1. Tom Bradshaw (Walsall) right footed shot from the centre of the box to the bottom right corner. Substitution, Crewe Alexandra. Ryan Colclough replaces Marcus Haber. Substitution, Walsall. Sam Mantom replaces Romaine Sawyers. Corner, Crewe Alexandra. Conceded by Adam Chambers. Corner, Walsall. Conceded by Harry Davis. Attempt missed. Romaine Sawyers (Walsall) left footed shot from the right side of the box is too high. Attempt blocked. Tom Bradshaw (Walsall) right footed shot from the centre of the box is blocked. Second Half begins Crewe Alexandra 1, Walsall 0. First Half ends, Crewe Alexandra 1, Walsall 0. Delay in match Lauri Dalla Valle (Crewe Alexandra) because of an injury. Attempt missed. Marcus Haber (Crewe Alexandra) right footed shot from the centre of the box is close, but misses to the right. Attempt missed. Andy Taylor (Walsall) left footed shot from the centre of the box is close, but misses to the right. Attempt missed. Tom Bradshaw (Walsall) right footed shot from outside the box misses to the left. Corner, Walsall. Conceded by Oliver Turton.